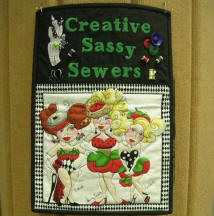 Creative Sassy Sewers is led by Kathleen Heinicke and Paulette Braga. For more information or to be added to the CSS NG Member email list please contact them. Meetings are on the 2nd Saturday of every month from 10:00 until 4:00. Bring your machine and project supplies for a day of fun at the South Manatee Library (6081 26th St West) in Bradenton. Hope this finds you happily sewing! Here is the information about our Shop Hop (to the north) for Saturday April 13. They open at 10 am and are expecting us! After lunch we will go to Jays Fabrics 801 Pasadena Ave, St Petersburg, Fl I haven’t been able to find out their sales for next month. Please email or call Kathleen so she can get a count and arrange vehicles and drivers.